Google Docs is very handy online suite for word processing. You can create, edit and print documents without need to install any software on the computer. 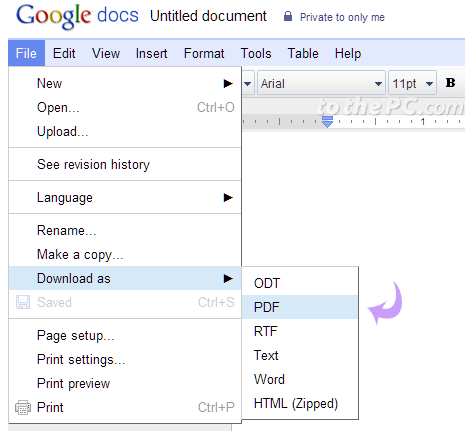 For ease of sharing and printing, it is recommended to convert Google Docs into PDF format. You can upload any PDF file to Google Docs, edit it and then convert back to PDF format for easy management, print and sharing. 1. Login into your Google Docs account at docs.google.com and open any document file. 2. Goto File > Download As > PDF option. This will download specific Google Docs file in PDF format. You can open downloaded PDF file in Acrobat reader or program supporting PDF files. In PDF format you can check on the formatting of text as it would appear on standard A4 size paper. Hence, printing of document is done perfectly as against direct online printing of document in different format.